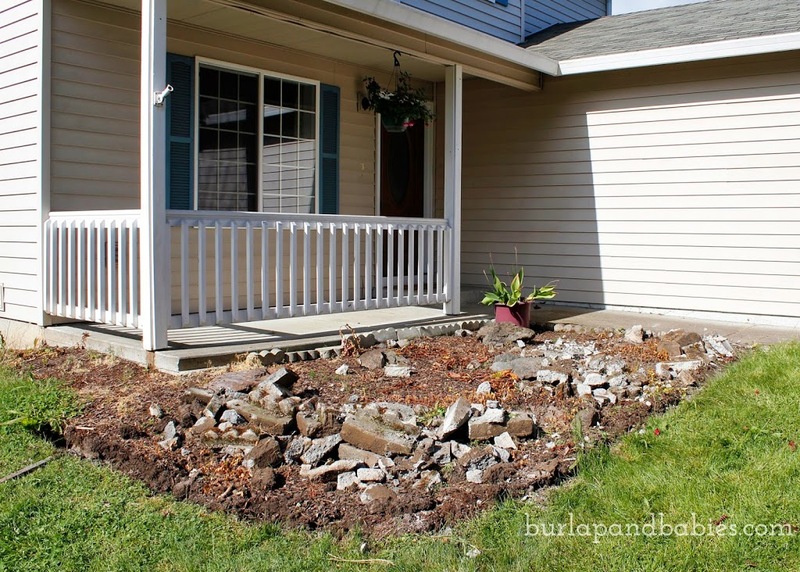 Learn how to make a retaining wall to drastically improve your curb appeal in the easiest and simple way in just a weekend WITHOUT needing professionals! 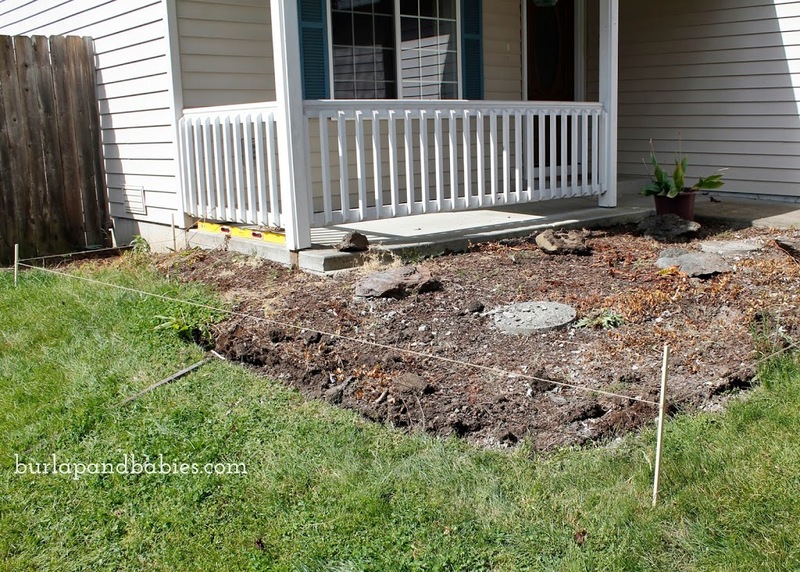 When we moved into our home one year ago, we immediately put on our home makeover list to build a retaining wall in the front yard. Well, with little nugget now on the way we’ve decided to try and knock out as many projects as we can this summer before we push it off for…say another ten years, while babies become the priority. We had planned on watching ads and seeing where we could find the best deals throughout the summer. Well, Memorial Day weekend Lowe’s happened to be running a great sale on the exact retaining wall blocks we had been looking at so we jumped on it! We read different tutorials online about how to build retaining walls and then just went with our gut and started destroying and building. Well, Justin did. This pregnant lady sat in a camping chair and supervised all weekend and shoveled dirt when she could. When our housing development was built 16 years ago I think they bought the cheapest edging stones possible and concreted them into the ground. 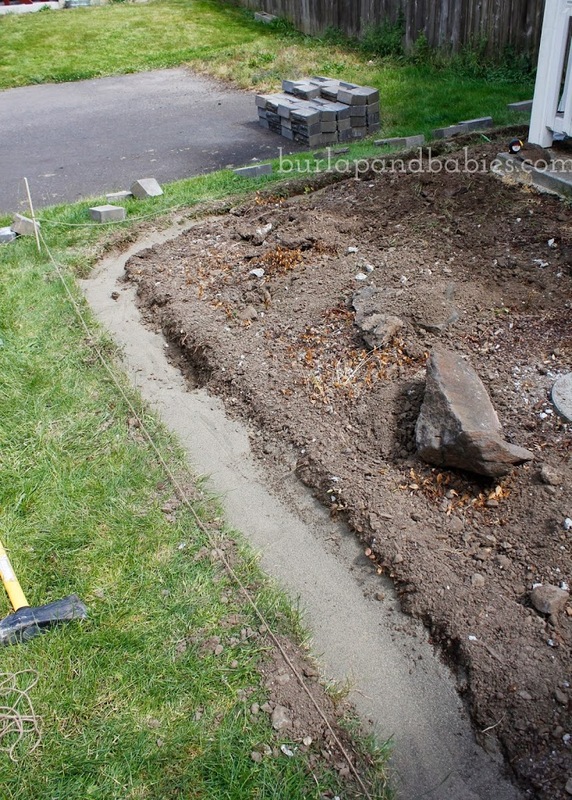 So, before we could even start building the wall, my poor husband had to break it all apart and then get all the little concrete pieces out of our garden bed. Hopefully, you won’t have to do that before you can start building your wall! This was what it looked like after he finished destroying the concrete. So, let me show you how to do it. 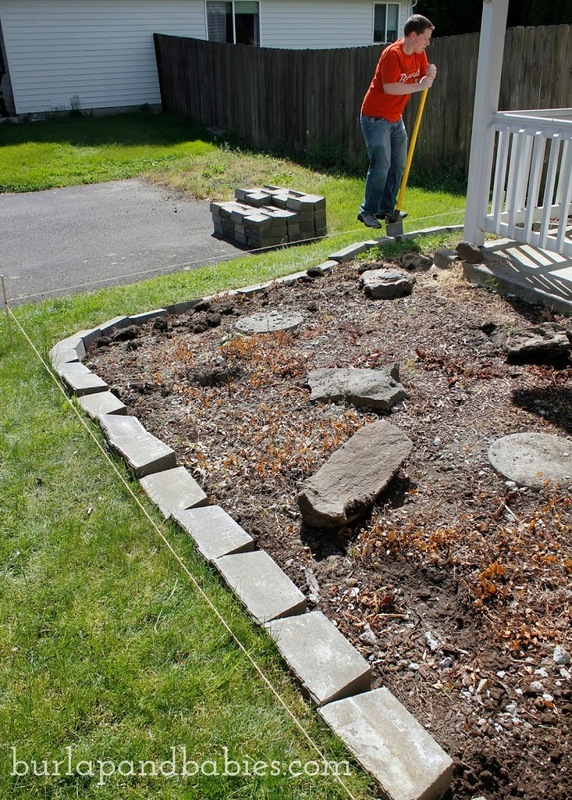 Decide where you want your retaining wall. We went with the general area that was previously there but widened it a bit on the edge furthest from the house to make more of a dramatic effect with three stacks of bricks. You can place one layer of stones around the edge so you can get an idea of where it will go and so that the bricks start and end where they should. Once you have your placement decided, take your shovel and dig a trench around the area. You’ll want to dig deep enough so that the bottom layer of stones are between the dirt and grass edge rather than just sitting on top. This will give your wall a more sturdy base. We actually used a small rototiller to help break up the dirt because man the dirt was tough and helped save a lot of time for digging the trench deep enough, but that certainly isn’t necessary. Once the trench was dug, we used some wood scraps we had in the garage and crafting twine – of course, because what else would a crafter have quickly on hand to use – and mapped out how many stones high we would need for the wall to be level. From there we measured down how far the bottom row of stones needed to go. This is the best picture I have to explain it, but if you are building the wall on a slope, you’ll need to measure out where the stones will go so that your wall will be level. As you can see, the stones closest to the walkway only have two levels. Then we had to make a step down where we had three levels, and then again around the tallest point we had to step down again for four tall. Once you get the path figured out put a layer of fine paver sand down so the stones have something to settle into so the wall is sturdy. This doesn’t have to be a thick layer. About an inch deep will do. This is the paver sand we used and it worked great! After that, go crazy with your level and put down your base row making sure each stone is level along the whole way. Each stone needs to be level side to side and front to back. This may seem tedious but it’s better to level out as you go rather than having to redo it once you finish if they don’t even out. If you choose to use concrete adhesive, be sure to have it ready once you start stacking to hold it all in place. Honestly, we didn’t use any to cut down on costs and we haven’t had any problems. Once we filled the bed with soil, the soil helped to hold the wall in place and make it secure. Update: Three years later and it’s still holding strong without an adhesive. For less than $200 and a few days of grunt labor, I’d say this was a super DIY success! I am so very excited with how this wall turned out and how drastic of a change it made. First impressions are everything and I’d say this majorly upped our curb appeal when people come visit our home for the first time. What DIY home projects are on your summer to do list? I’d love to hear about your list in the comments below. Love this? 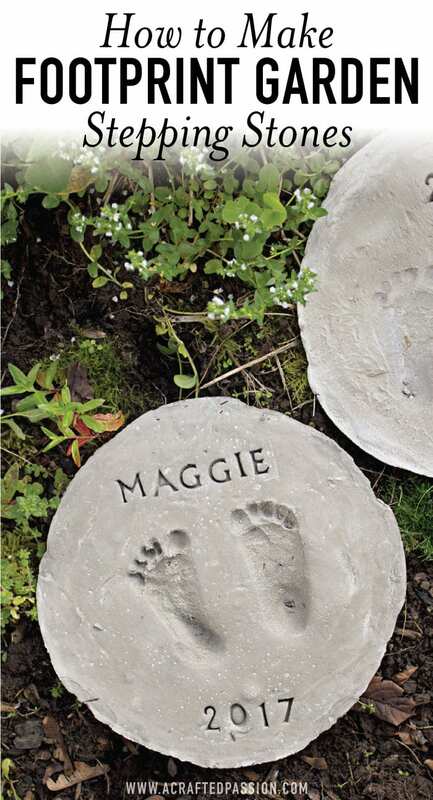 I think you might also love these garden stones! 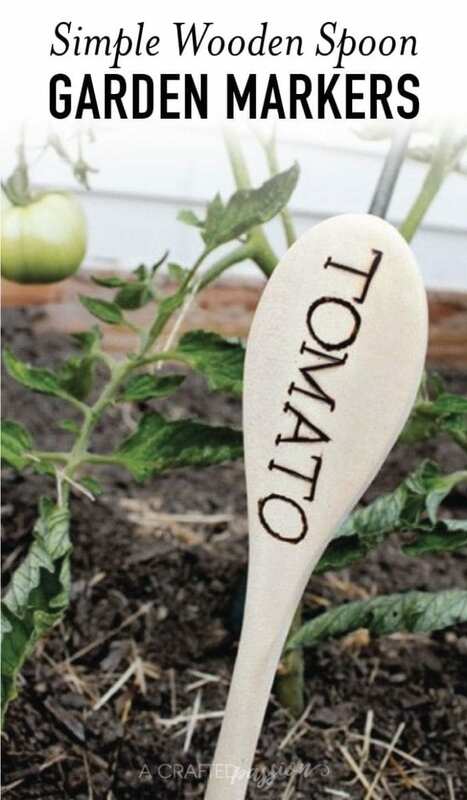 Use cheap wooden spoons from the Dollar Tree to make these simple wooden spoon garden markers with a wood burning pen. or how about trying your planting skills with the mini succulents. 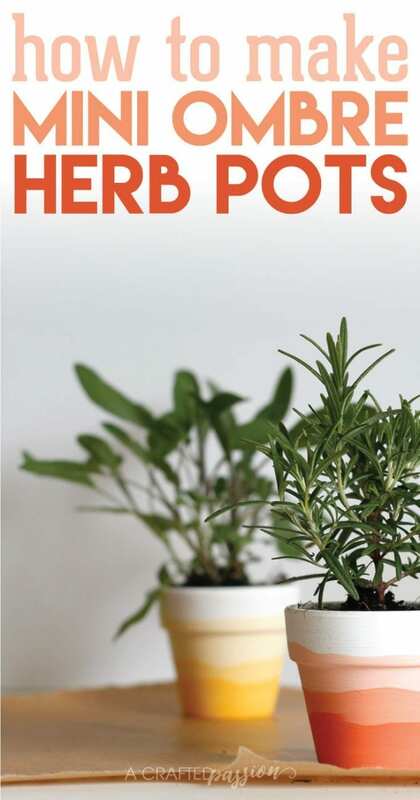 Create your own mini ombre herb pots! That retaining wall looks awesome! Great job! Nice job! Would love if you came and shared you posts on the Merry Monday Linky Party. We go live Sundays at 6pm PST till Thursday 9pm PST. Love the bricks … looks like hand laid bricks or cut rock. Really made a great looking planting bed. Great job. Awesome! 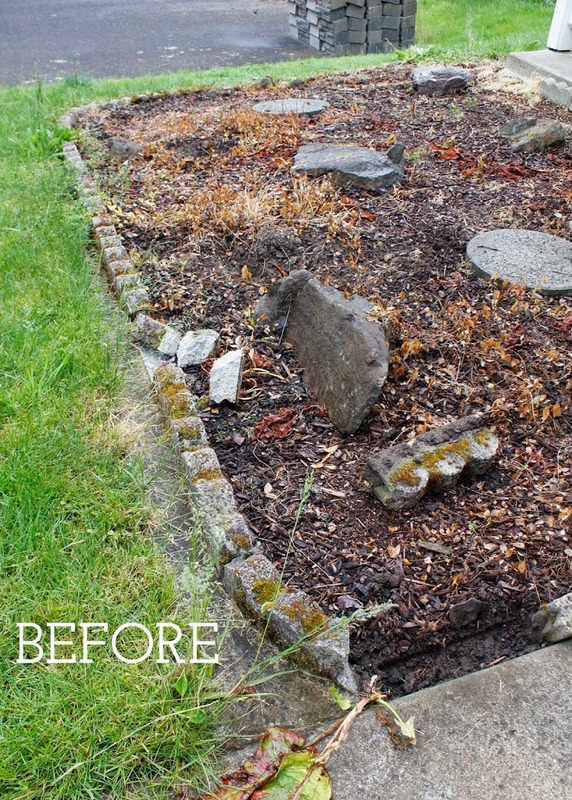 Love the before and after photos…very inspiring! 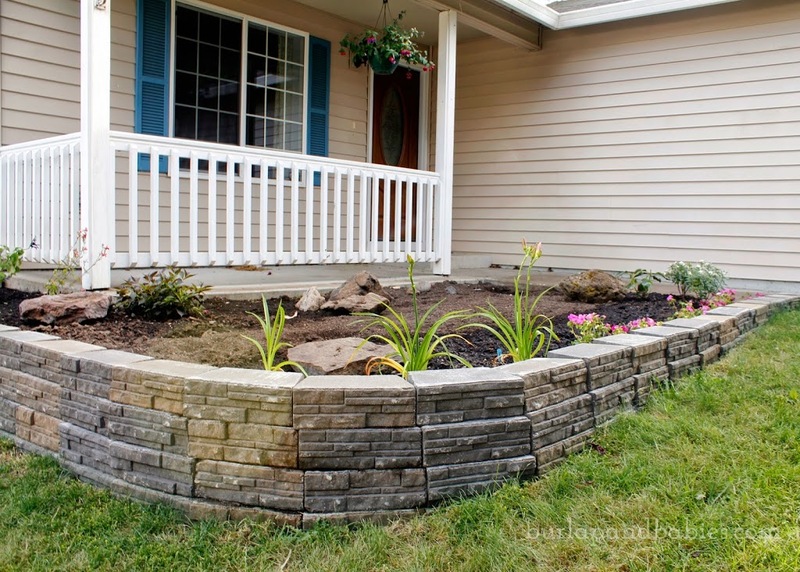 I think your retaining wall looks fantastic! I love the stones that you used. I like your advice to make sure every stone is level when you first put it down so that you don’t have to try to fix it later. It’s much easier to make sure everything’s even to start with. Thanks for sharing! The tiller suggestion I think is priceless. Great hack idea! Thank you. I’m going across the whole 40 ft of the back yard and half the front. You saved me!!! That retaining wall looks awesome! The post is providing Great advice especially, does the first time then you don’t need to fix it later. It is awesome DIY project. I will try it soon. I can’t believe that this is DIY, it looks absolutely professional! I love how the retaining wall added to the curb appeal. I personally like how the wall seemed to make the house look bigger by being the same height as the patio and wrapping around it as well. I don’t know if I would ever have the skills to pull something like this off, great work!